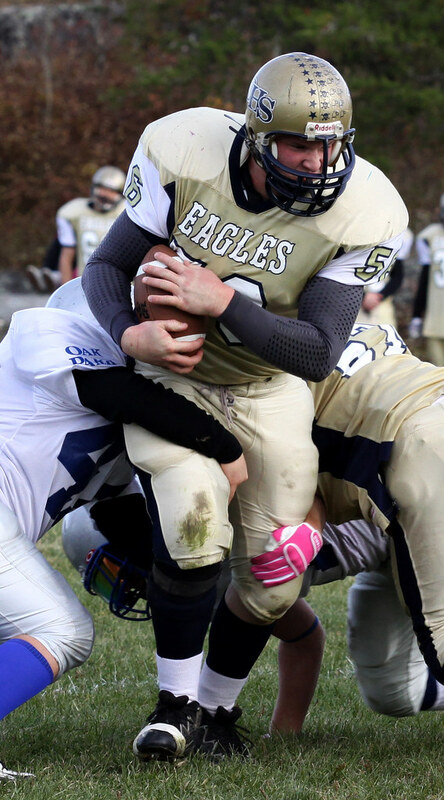 Eagles LB David Benham plows his way through the Raiders defence during Friday's 25-8 romp over the Oak Park Raiders. The Eagles Football team finished the regular season at home Friday with a 25-8 win over the Oak Park 2 Raiders. After an emotional presentation to the Paquin family in memory of former Eagles footballer Pierre Paquin, and a presentation by retiring players to their parents, the Eagles got to work on the field against the Raiders. Derrick Tattrie, Mitchell Boudreau and Michael Lampshire all brought home touchdowns for the Eagles. Adam Swientek made one conversion while Nick Nault added the two point conversion. The Defensive teams forced two safeties. The Eagles travel to Winnipeg next Friday to begin their playoff run against Murdoch McKay. Game time is 3:00.